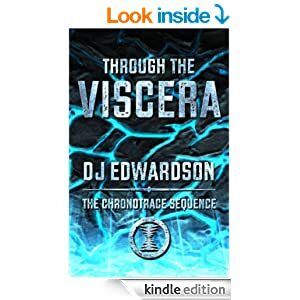 I recently finished reading DJ Edwardson’s THROUGH THE VISCERA, and thought I’d talk about it a bit here. You may recall that I reviewed the first book in this series about a year and a half ago HERE. I was excited to get my hands on the sequel, and the story did not disappoint. We pick up the story with the main character, Adan shortly after the massive storm that destroyed the technological city of Oasis at the end of book 1. Adan and his friend, Gavin must now search for their missing memories, in hopes of discovering who they once were. Using a device called the Chronotrace, which has the ability to show the past, they set off on their adventure. However, their adventure gets hijacked fairly quickly and Adan and Gavin are separated when they are attacked by two separate parties. Adan ends up once again with the desert nomads, while Gavin becomes the captive of what is left of Oasis, in the hands of a madman who is searching for his lost son. I only wish that I had gone back and re-read INTO THE VAST shortly prior to reading THROUGH THE VISCERA, because the author dumps you right into the world without doing any back-tracking to speak of. Generally, I appreciate this method, as I grow weary of reading the same back-story over and over again. However, with this series, everything is unfamiliar and there is a lot of futuristic technology and terms, and I had to keep flipping to the glossary in the back to remind myself what somatarchs were and who the Developers and Assessors were, and what was the difference between a bioseine and the esolace… and, as Adan may still be lacking his memories, he is much more capable and knowledgable in this book, which meant that the author spent a lot less time explaining all of these terms, assuming the reader remembered them all from book 1… which I would have, had I read it more recently! However, if you can get past the unfamiliar terms, this story is a fast-paced, intriguing adventure. This second installment of the series opens up the world a bit more and lets the reader glimpse even further into this sci-fi setting and explore the landscape and the people living there. Adan and Gavin receive a lot more character development, and we are introduced to even more characters – some familiar, and some new. I enjoyed reading this book, and watching Adan grow and develop. I like many of the characters, but Adan is definitely my favorite. Perhaps this is because he starts out so completely like a child in book 1, innocent, uneducated, naive, trusting, and with no context for anything he experiences. In book 2, he has experienced loss, betrayal, hurt, kindness, death, and family. He still lacks his earlier memories, but he has made some new ones. His search for the memories he lost is still his main goal, but the reader begins to feel that the urgency of this goal has diminished some. For why does Adan want his memories but to learn who he was? And yet, through all his adventures, he is achieving the goal of learning who he is, and whoever he was before begins to matter less. He is a good man, with a sense of right and wrong. He possesses a fierce loyalty to the ones he deems friends, and though he fears his enemies, he bears them no ill will. His budding trust and relationship with Numinae and the deeper questions he begins to ask about life, the Creator that the Welkin believe in, and mankind’s true purpose begin to overshadow his questions about his own past, and seem far more important in the long run. “But if that’s so, then why bother to pray? If we’re meant to simply accept things, what is the point of asking for help?” Adan felt brash for even asking the question, but of all people, he thought Zain would understand what he meant. I definitely recommend this second installment of The Chronotrace Sequence. If you enjoy sci-fi, adventure, mystery, and intriguing characters, I think you’ll enjoy this series. Thanks for the nice review! That’s one of my favorite passages as well. I appreciate you taking the time to share your thoughts. Hopefully the final book will be finished soon!